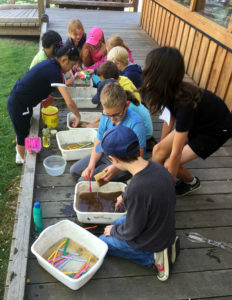 Our popular five-day marine biology science summer day camps introduce children to the birds, animals and plants of the Cowichan Estuary. 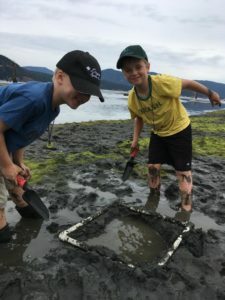 We’ll explore the clam beds, eelgrass mudflats, and the beaches at Hecate Park. Campers will use scopes on the observation tower, beach seines, plankton tows, shovels and buckets to find out who lives here. They’ll get to know the region’s intertidal and sea creature in our water and up close in our touch tank, and have an opportunity to get acquainted with young Coho salmon in our fresh water aquarium. There will also be other fun age-appropriate hands-on science activities, games, hikes, and crafts, as well as a chance to explore our microscope stations, giant maps, interactive exhibits and ecology library. Camp fees are $215 per child for a total of five days. Single Day Attendance: $40 per day per child only if the camp is not fully booked. Please register by phone or in-person for single days. Some Bursaries are available to eligible children from the Cowichan Valley Naturalists’ Society. All Camps run from 9 am to 3:00 pm. You may drop off your child between 8:45 am and 9 am. As our camp leaders are busy setting up for the day, we cannot offer early drop off or late pick up. Parents will be charged late fees for not adhering to drop of and pick up times. All camp participants must to be able to eat, dress and toilet independently. For children with special needs, contact camps@cowichanestuary.ca to discuss possible accommodations. The Eventbrite link for registrations is COMING SOON!! Then you can select a camp, sign up, and make payment. Payment can be through a credit card on Eventbrite or cash/cheque dropped off at the Cowichan Land Trust office. IMPORTANT: Your registration is not considered complete until we have received the medical information and waiver forms. Payment and forms must be received at least 2 weeks prior to camp start date or your registration will be forfeited.